Title: CP 4433 CP's Tomah Sub. Description: Roadswitcher Power Between Shifts. Description: CP's La Crosse Road Switcher CP-4433-4611. Description: CP's La Crosse Road Switcher is Pumping Air on a 71-car Pickup for DM&E Bound Train 487. Description: CP's La Crosse Road Switcher. Description: CP 4433 SOO-GP-40 2016 exMilw. Description: A plain-jane, but professional looking, GP38-2 in the newest image rests on Presidents Day. Description: H41 tied down in the Buffalo Siding for the weekend. Description: One of the few repaints last year. Description: Thanks to C. Vision Productions for the idea of shooting this photo and to fellow railfan and friend Mark Muraski for telling me how to get back to this location to get this photo. Description: H41 departing the Buffalo Siding and heading back on the main after meeting a train of grain loads. Description: CP 4443 is a former Soo Line GP38-2 on former Minneapolis, Northfield and Southern tracks. The train is northbound. Description: A loaded Dresser Roars through New Brighton with a neat looking set of power. Title: CP 4433, CP's Tomah Sub. 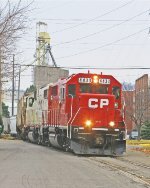 Description: CP 4433 Moves Toward More Street Running. Description: CP Is Starting to Rebuild its Wall Street Trackage. Description: Street Running One Side To the Other Side. Description: CP Along 2nd Street in Winona. Title: CP 4433, CP's River Sub. Description: Bay State Milling in Background. Description: Power From CP's Train 580.